IT was a promising week for South Australian father-son prospects, with likely types staking their claim for draft selection across all levels of the South Australian National Football League (SANFL). Meanwhile, the state’s brightest draft hopefuls continued to tick all the right boxes, with the likes of Izak Rankine and Jack Lukosius bagging a combined seven goals to keep the spotlight firmly on them. Norwood continued their form and accounted for North by 30 points. The key players for Norwood continue to be Luke Valente and Kade Chandler, who both had solid performances again. Seb Quaini chimed in with a five-goal haul for the Redlegs. Roosters midfielder Boyd Woodcock dominated possession for the Roosters with 23 disposals and seven clearances, putting him in the best again. In probably the upset of the round, Sturt managed to defeat the Centrals by 19 points. Under-ager Jed McEntee continued to rack up possessions and find himself in Sturt’s best with 28 possessions and five tackles. Father-son prospect Casey Voss has been very consistent for the Blues in recent weeks, and along with standout ruckman James Braidwood who again dominated with 27 hitouts and seven marks. Centrals key mid Aaron Neitschke was best with another nine clearances, six tackles and 32 possessions, while forward Malachai Ahmatt-Lovett chimed in with two goals. The Eagles were very good again and dominated the second half in a 27-point win over Glenelg. Father-son Jackson Mead looks a player. having had 25 disposals, seven marks and two goals in an all-round game for the Eagles. Jarrod Miller was good in close winning seven clearances for the winners. Glenelg continues to be around the mark and led at half-time. Sacred Heart’s Darcy LeCornu showed his abilities with three goals and was his side’s best alongside Prince Alfred College (PAC) student Will Gould. Ruckman Tom Jones gave his players first use with 37 hitouts in his best game. Competition favourite South Adelaide gave a 65-point hiding to West Adelaide, with the Panthers having an even spread of contributors with James Grimley booting six goals, PAC student Tom Sparrow had 28 possessions and eight clearances, while father-son Hayden Sampson was in the best. The Bloods fought hard and Beau Nunan’s four goals were a highlight as well as Jason Westley’s 18 disposal and six inside 50s. It was another standout week for young talent at League level. Trinity College and Central’s Jackson Hately keeps going from strength to strength with a strong 25-possession and two-goal game in their demolition of Adelaide Crows. 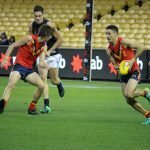 The Eagles’ smashing of Glenelg produced highlights with key draft prospect Jack Lukosius booting three goals and collecting 11 marks, while father-son prospect and 2017 Under 18 South Australia member James Rowe made his league debut for the Eagles with a close to best on ground 27-disposal performance. West Adelaide’s Izak Rankine finally returned to the playing arena and clocked up four goals in the two-point victory competing against his brother Matthew Rankine for South. The family theme continued in this game with sons of Brisbane’s David Noble Mark and John Noble competing against each other in their respective sides. AFL Academy member Hugo Munn was also selected in Sturt’s Anzac Day win over Port. 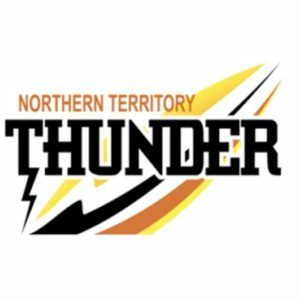 North’s Frank Szekely found his range with two goals in their loss to Norwood, and he continues to push his name in front of South Australian Under 18 selectors. Conor Rozee was also solid with a goal and 19 disposals. For Norwood, Isaac Saywell found his way into the Reserves side and was solid with 13 disposals. In the Eagles’ narrow loss to Glenelg, running machine Kai Pudney racked up 19 possessions and over-aged father-son Connor McLeod added four goals. Glenelg’s 2017 South Australian Under 18 member Brad McCarthy was again in the best for the Tigers. 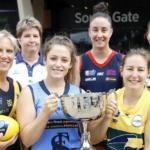 This weekend saw the Grand Final for SANFLW Season and a victory to South Adelaide over 2017 Premier, Norwood. The Panthers Women’s side had been the standout team all season but by not means did they get it all their own way in the Grand Final, securing a five point victory. South’s Cheyenne Hammond capped off an impressive season securing the best on ground medal.